Skeletal muscle is mostly under conscious / voluntary control of the central nervous system as part of the somatic division of the motor peripheral nervous system. Skeletal muscle tissue is the only type of muscle tissue that is under conscious (or voluntary) control via your somatic nervous system. Your brain sends signals down your spinal cord that connects with peripheral nerves to command the muscles to contract or to relax. Skeletal muscle is the type of muscle that most people envision when the word 'muscle' is used. These are the noticeable muscles that can give shape to our skin and act to move the various parts of your body at will. Skeletal muscles are able to move parts of our body because they are attached to skeletal bones through structures of fibrous connective tissue called tendons. 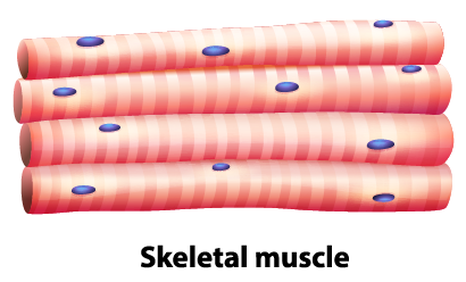 A skeletal muscle (like the biceps shown in the illustration) is a collection of muscle bundles or fascicles. 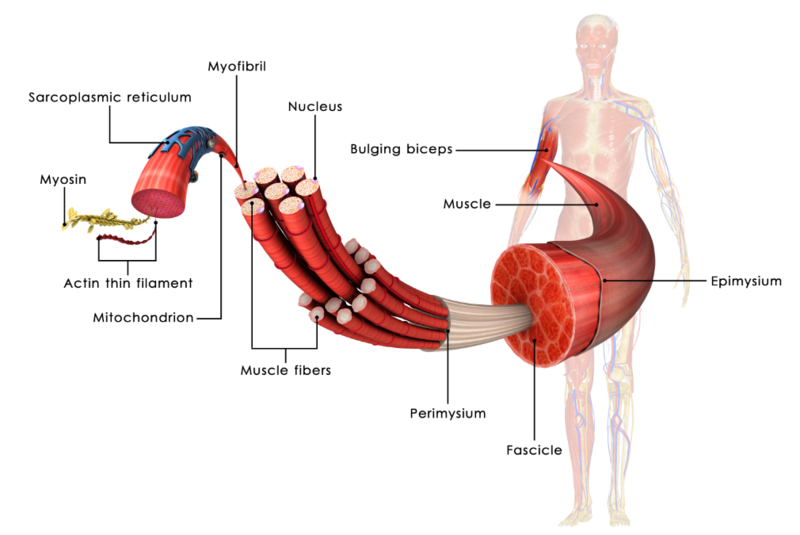 Each fascicle is made up of a number of muscle cells (or myofibers or muscle fibers). Each muscle cell is composed of hundreds to thousands of myofibrils. Each myofibril is composed of many myosin thick filaments and actin thin filaments. The bundles of long, cylindrical fascicles are bundled together and covered by a protective membrane called the EPIMYSIUM. The muscle fibers are bundled together and covered by a protective membrane called the PERIMYSIUM. The wispy sheath of connective tissue that surrounds each individual muscle fiber is called the ENDOMYSIUM. Each individual MUSCLE FIBER / MYOCYTE / MUSCLE CELL is composed of multiple long, cylindrical fibers called MYOFIBRILS. ​Each MYOFIBRIL contains a long string of repeated units called SARCOMERES. • A myocyte (also known as a muscle cell or a muscle fiber) is the type of cell found in muscle tissue. •Myocytes are long, tubular cells that develop from myoblasts to form muscles in a process known as myogenesis. Striated muscle tissue consists of myocytes that appear to be striped (transversely) with alternating dark and light bands of color. These striations are visible when the muscle tissue is viewed histologically (on a slide). Each elongated, cylindrical unit is a skeletal muscle cell, called a muscle fiber or myocyte. The plasma membrane of skeletal muscle cells has a special name; the sarcolemma. The sarcolemma is unique, because it continues deep into the muscle cell to form the “T-tubules” or “transverse tubules”. The t-tubules are continuous with the sarcolemma. The fluid that fills the lumen (inner liquid) of the t-tubule is considered extracellular space. The intracellular fluid of a muscle fiber is referred to as the myoplasm or sarcoplasm. 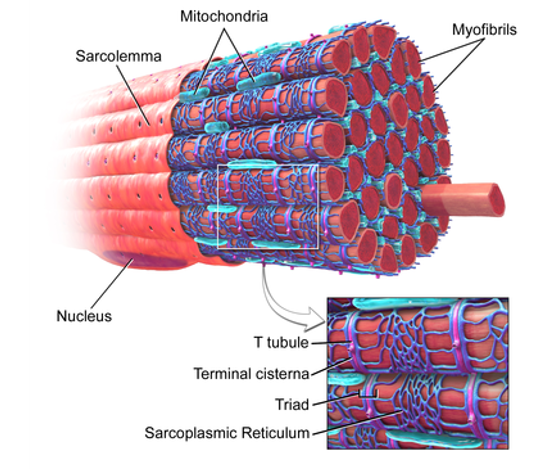 Within the sarcoplasm, there are numerous specialized structures which are unique to muscle fibers. The sarcoplasmic reticulum is a highly specialized structure that is tightly wrapped around individual myofibrils. The striations of skeletal muscle fibers are due to the presence of repeated units called sarcomeres. The sarcomere is the functional unit of muscle contraction. The sarcomere contains filaments which slide past each other, contracting (shortening) the cell upon command from the nervous system. The sarcomere is the functional unit of striated muscle. Let's look at the cross-bridge within the context of a single sarcomere to understand how contraction occurs. In order for the muscle to contract the actin and the myosin molecules of the thin and thick filaments have to interact with one another. When the actin and myosin interact, they are said to be connected by cross-bridges. The cross-bridges refer to the myosin head groups that interact with a myosin-binding site on actin. Those myofibrils are composed of contractile units called SARCOMERES. Two regulatory proteins closely interact with actin. A regulatory protein called tropomyosin normally lies over the binding sites and prevents the interaction of the myosin head group with actin. When the myoplasmic Ca2+ concentration is low at its resting level, tropomyosin covers the myosin binding site of actin. The binding of Ca2+ to troponin moves the troponin-tropomyosin complex out of the way exposing the myosin binding site. This allows the myosin head to interact with actin. Actin makes up the thin filaments of the sarcomere. The actin units have myosin binding sites. When calcium is present, myosin is able to bind to the myosin binding site of on actin. It can do this because the myosin head has an actin binding site on it! Membrane Depolarization / Fiber Activation: The fiber must be activated or stimulated by a nerve (motor neuron)so that the membrane/sarcolemma becomes depolarized (the membrane potential becomes less negative due to an influx of positively charged sodium ions). Action Potential Generation: The change in membrane potential must be strong enough to generate an action potential in the sarcolemma. Action Potential Propagation: Once the action potential is initiated, it will be propagated along the sarcolemma. Calcium Release: Calcium is released from the sarcoplasmic reticulum. The whole process really begins with the command from the central nervous system. The decision to make a conscious movement is made in the brain. The command to move is sent from the brain’s motor cortex and travels down the spinal cord, to the motor nerve (directly or indirectly). The signal initiating movement of the muscle travels from the central nervous system to the motor nerve (motor neuron). The signal reaches the terminal end (called the axon terminal) of the motor neuron causing the release of the neurotransmitter, acetylcholine. The signal reaches the terminal end (called the axon terminal) causing calcium channels to open. The influx of calcium in the axon terminal causes the release of the neurotransmitter, acetylcholine. Acetylcholine diffuses passively across the synaptic cleft and transiently binds to post- synaptic (nicotinic) receptors. This binding causes the receptors to open, allowing an influx of sodium ions into the muscle fiber. Troponin changes conformation when it binds calcium, and that moves the tropomyosin away from the myosin binding sites, allowing cross-bridge formation and muscular contraction. Binding of myosin cross-bridges to the binding sites on G-actin molecules. Power stroke of the cross-bridges and movement of the thin filaments over the thick filaments. Continued cross-bridge cycling for as long as ATP is present and Ca2+ concentrations remain high in the myoplasm. Muscle shortening and/or tension development. 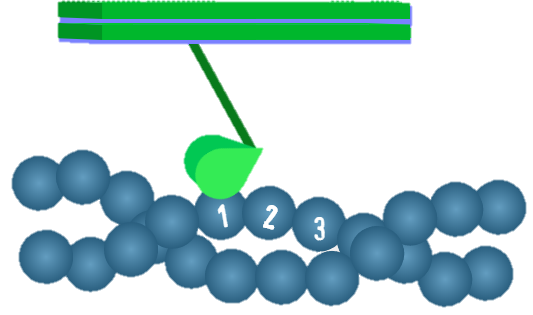 In this step, the myosin head interacts tightly with a G-actin of the thin filament. The part of the myosin head group that interacts with actin is referred to as the actin- binding site, and the part of the G-actin molecule that interacts with myosin is referred to as the myosin-binding site. The myosin head makes a 45-degree angle with the thick filament. This is referred to as the rigor state because if there is no ATP present (such as after death), the thin and thick filaments maintain this tight interaction rendering the muscle very stiff (RIGORMORTIS). ​ In this step, an ATP molecule binds to the nucleotide-binding site of the myosin head. Binding of ATP causes the release of the myosin head from the G-actin molecule. In addition to the actin-binding site, the myosin head also has a nucleotide- binding site. This is a site where ATP and ADP interact with myosin. Myosin is an ATPase (myosin ATPase) in that it has the ability to hydrolyze ATP to ADP and inorganic phosphate (Pi). 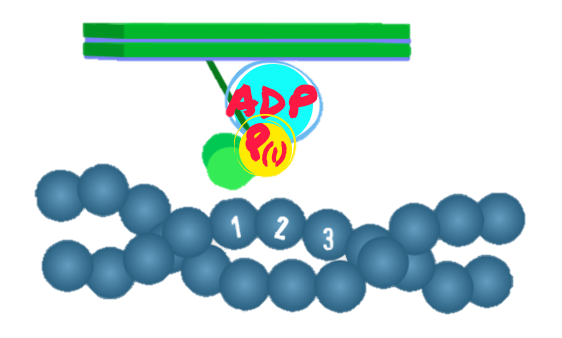 In this step, the myosin head converts the bound ATP to ADP and Pi. Both ADP and Pi remain bound to the myosin head. The energy released from the hydrolysis of ATP is used to change the conformation of the myosin head, so that now it makes a 90-degree angle with the thick filament. This change in conformation “energizes” the myosin head (i.e., it places it in a high-energy state). At this point, if sufficient Ca2+ is present in the cytoplasm (see Excitation-Contraction Coupling below), the myosin head attaches to a G-actin one or two positions away from the one bound in Step 1. If there is not enough Ca2+ present in the cytoplasm, the myosin head remains in this energized 90-degree angle. A rise in cytoplasmic Ca2+ concentration is essential and evokes a series of events that facilitates the binding of myosin head to G-actin again. Please note that the relaxed state refers to the muscle cell and not to the conformation of the myosin molecule. At rest, most skeletal muscle fibers are in this “relaxed state”. ​ This is the power stroke step. Now Pi is released from the myosin head. As Pi is released, the energized 90-degree angle myosin head begins to assume its original 45- degree angle. At this point, ADP is released from the myosin head, and the myosin head remains tightly bound to the G-actin. This brings us back to the beginning of the cycle at Step 1. If there is ATP around (and if the cytoplasmic Ca2+ concentration is high; see below), the cycle will repeat itself again and again. 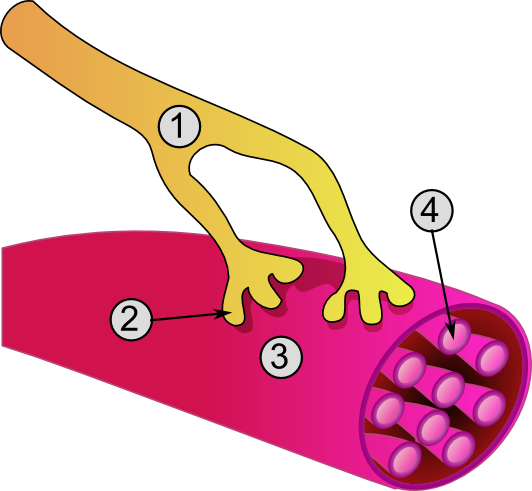 The repeated action of the cross- bridge cycle results in the sliding of the thin filaments over the thick filaments, which will lead to muscle shortening. It is important to emphasize that the cross-bridge cycle can take place only if the cytoplasmic Ca2+ concentration is high. Thus, when skeletal muscles are at rest and the cytoplasmic Ca2+ concentration is low, the cross-bridge cycle does not take place. Instead, the myosin head groups remain in an “energized” state. A muscle twitch is the minimum muscle response to a single action potential generated by a motor neuron. A single muscle twitch, which is a single contraction in response to a brief threshold stimulation. Threshold stimulation: the smallest amount of stimulation that result in sarcomere shortening. A threshold stimulation is the smallest amount of stimulation that will actually result in a contraction. If we administer a single threshold stimulus in a lab, we get a single muscle twitch in response. We can measure this with a Myogram. Excitatory input from the motor neuron must reach a minimum threshold (minimum level) to trigger the flood of calcium from the sarcoplasmic reticulum, in order for any muscular repose to occur. This is the lag time due to the time needed for the action potential to spread through the sarcolemma and T-tubules and trigger calcium release from the sarcoplasmic reticulum. No tension in muscle, no force is generated yet. If the tension becomes great enough to overcome the resistance of the load, the muscle shortens. The number of active cross bridges is declining. Muscle tension decreases to zero. Myogram tracing returns to the baseline. Muscle contraction results in different types of movement. The particular movement is a direct result of the muscle attachment. Each of these actions can be described in one of two ways. You can describe a muscle's action in terms of the bone to which the muscle is attached to or the appendage that is moved. For example, the biceps brachii performs flexion of the forearm as the forearm is moved. You can describe a muscle's action in terms of the joint that is moved upon the contraction of that muscle. For example, that same muscle, the biceps brachii, performs flexion at the elbow, in which the elbow is the joint. Muscle Functional Roles: The human body has over 500 muscles responsible for all types of movement. Each of these muscles has a name; for example, again, the biceps brachii and now the triceps brachii, responsible for both forearm flexion and forearm extension, respectively. When movement of a body part occurs, muscles work in groups rather than individually. Working together enhances a particular movement. During that particular movement, individual muscles will play different roles depending on their origin and insertion. Skeletal muscles are attached to bones on each end by tendons. The origin is the fixed attachment, while the insertion moves with contraction. The action, or particular movement of a muscle, can be described relative to the joint or the body part moved. Muscles CONTRACT (SHRINK) - Muscles always PULL they never PUSH. •When a muscle contracts, it pulls the bones it connects to closer to one another, by decreasing the angle of the movable joint that is spans. •In this “muscle machine”, it is the “pulling action” of the biceps muscles that exerts the force that pulls the arm upwards. •AND…it is the “pulling action” of the triceps muscles that exerts the force that pulls the arm Downwards.